None of us set out to be broke. A car loan here, an unexpected emergency there, and a couple hundred swipes of the credit card later—we’re screwed. And we have no idea how it happened so fast. You don’t have to be homeless to be broke. Broke is only being able to pay minimum payments on everything. Broke is being in debt up to your eyeballs. Broke is buying a brand-new car because you can “afford” the monthly payments but not having $1,000 in your emergency fund. I didn’t realize that I was living beyond my means until I read this. Thankfully for me, that realization came at just the right time. This book gave me the wake-up call that I didn’t know I needed. The first step is recognizing the problem. So let’s get started. At some point, I think we’ve all been guilty of relying on credit cards to cover the cost of a vacation. The typical vacation costs $1,145 per person. A family of 4 would need $4,580. 47% of Americans don’t even have enough money to cover a $400 emergency. So if you’re still paying off a trip several months after you’ve gotten home – you’re living beyond your means. If it will take you more time to pay it off than the use you’ll get out of it, then you really can’t afford it. Instead, start saving money in a vacation sinking fund. There are things you still have to buy to live. And since you’re buying things you’d normally get anyway, you might as well save money. For you, this might mean shopping around your grocery stores flyer. Or buying a FoodSaver to preserve your food. For me, there are several things I always buy online because that’s how I get the best deal. And when I combine that with a cash back program like Ebates, I know I’m getting the biggest bang for my buck. You sign up for an Ebates account (it’s free) and use the search bar to find the retailer you want to shop with. Then, once you accumulate your earnings ($5.01 is the minimum payout) – Ebates will send you a check or deposit that money into your PayPal. If your first thought is, “Emergency fund? What’s that?” then it’s time to get acquainted. Most financial experts recommend keeping an emergency fund large enough to cover 3-6 months of your expenses. Personally, I recommend saving up enough money to cover at least 6-9 months of expenses. After all, you can never have enough cushion. I had to learn this lesson the hard way. Guess who didn’t have an emergency fund? It’s not a matter of IF emergencies will happen, but WHEN they’ll happen. Try creating a goal to save $1,000 for your emergency fund, then once you’ve done that, shoot for saving 3-6 months worth of expenses. Do you plan your finances based on money you’ll probably have soon-ish or bonuses you should get? This could leave you sh-t out of luck if something unexpected happens. Jobs can be lost, raises and promotions can be delayed, and refund checks can be substantially lower than what you might’ve thought. If it’s not in your hand OR your bank account, then it’s not yours. Only count your money when you have it. Having a written budget is one of the most important steps towards financial freedom. If you make budgeting a priority, you’ll have a much higher chance of winning with money. When you write your income and expenses down – you start to identify the small leaks in your spending. For me, it was the $40 a week I was spending to eat out. For you, it might be a daily coffee run, or a high cable bill. Whatever it is, you can’t measure it unless you track it. Do you “float” your lifestyle with credit cards? Are you guilty of transferring balances from one card to another? Do you use plastic to pay for basic necessities like groceries and utilities? Many people are considering this the new norm. People who win with money don’t use plastic to inflate their lifestyle. I credit a huge part of my financial success to this book. The wealthy man knew that borrowing money was a bad idea because of interest. Instead, he lent money to other people and charged them interest for it. It can lead you down a path of perpetual broke-ness and unhappiness. Don’t we all want that nice house in that great neighborhood? Isn’t that a part of the American dream? Today, the average house size is 2,641 square feet. Families are smaller. We all want more and more, until “more” because something we can’t afford. Your house payment (including property taxes and insurance) should be no more than 25-30% of your take-home pay. The same goes for renters. Research shows that the average person can pay 30% or less of their take-home pay towards housing and still enjoy a reasonable standard of living. Give your budget room to grow. Think about these things before you spend too much on a house. It’s never a good idea to base the amount you *think* you can afford on a 30-year fixed mortgage. There are several reasons why this is a bad idea, but interest is the biggest. In the long run, you’re paying the bank twice as much in interest payments. Don’t do it just so you can have extra spending money in the short run. If you can’t afford the payments on a 15-year mortgage, then you can’t afford the house. We all know someone like this. They have too much month left at the end of their money. People who live this way usually think they can’t save money or cut expenses. They’ve become used to their habits. If this is you, then I encourage you to take a hard look at your spending habits. Create a bare-bones budget and make your lifestyle fit your paycheck. If you’ve read about how I’m saving $15,000 this year, then you know I recently cut my cable package from $170/month to $8.25/month ($99/year) by switching to Amazon Instant Video. I also bought a coffee maker so I could make coffee at home. I then started meal prepping and freezing leftovers so I don’t eat out as much. Start small by trying to find at least 2-3 expenses to cut from your budget. Are you still facing that whopping credit card bill? Haven’t made a dent in your student loans? This is the point where you have to become sick and tired of being sick and tired. There are two really popular debt payoff methods: the Debt Snowball and the Debt Avalanche. Debt Snowball vs. Debt Avalanche – What’s the best one for you? 34% of young adults have nothing saved for retirement. Of the ones who do have retirement savings, 21% have less than $10,000. There’s no pension for our generation, millennials. We have to save for our own retirement. Don’t ignore the fact that someday, you might not be able to work. And besides, who wants to be 75 and still stuck at a 9-5? If you don’t know where to start, I recommend reading this. Yikes. Why do people think that’s a good move? Here’s the thing – if you withdraw money from your 401(k) account before you’re 59 1/2, you’ll have to pay an early withdrawal penalty plus income tax. Don’t steal from your future self just to make current ends meet. Emergencies happen, and that’s what your emergency fund is for. It’s so easy to swipe a card and not realize how quickly the balance adds up. I think we’ve all been there before. I didn’t want to spend the rest of my life living that way. Interest payments are the biggest problem when it comes to borrowing money. After all, interest is what causes us to spend so much more in the long-run. But if you can’t afford to pay off the balance completely, you still have options. Don’t just settle for a high APR. If you have any kind of debt whatsoever (student loans, car payment, or credit cards) you should do what you can to lower your interest rate. You’ll save thousands over the course of the loan just by doing this. The best part? A lower interest rate usually comes with a lower monthly payment too. This can as easy as calling your credit card company and negotiating a better rate, or you can use a company like SoFi. SoFi will help you get a better, more affordable, interest rate. I go into much more detail in my SoFi review, so if you’re interested in reading that, then click here. Quick note: the SoFi link above gives you a $100 welcome bonus. Do you go into debt to pay someone for a job you could’ve done yourself? Are you too busy to mow your lawn, clean your house, wash your car, or paint your nails? Some expenses are unavoidable (like daycare and car repair) but a person who is in debt can’t afford to spend money on skills they already have. Instead of paying someone else to do a job for you, try doing it yourself and putting that money something else. The difference between someone who is smart with their money and someone who isn’t – is what they do with their paycheck once they get it. If your first inclination is to spend your check on a WANT versus a NEED, then it’s a sign of a larger issue. Shopping may bring short-term happiness, but in the long-term, it’s a fast way of staying broke. I found that using the 24-hour rule (where you wait 24 hours before making a purchase) helped me truly decide if I really needed something. Let’s be honest, when you know you owe money – it can be really hard to face the bills. But when you’re trying to get your financial sh-t together, this is usually the first step. So what I had to learn is that you have to face the financial facts if you’re trying to better your situation. Get a clear idea of how much you owe and to whom you owe. Then, add up what you have in savings. Then with the help of a budget, you’ll be able to start your journey towards financial freedom. It’s probably because you feel guilty about your spending habits. 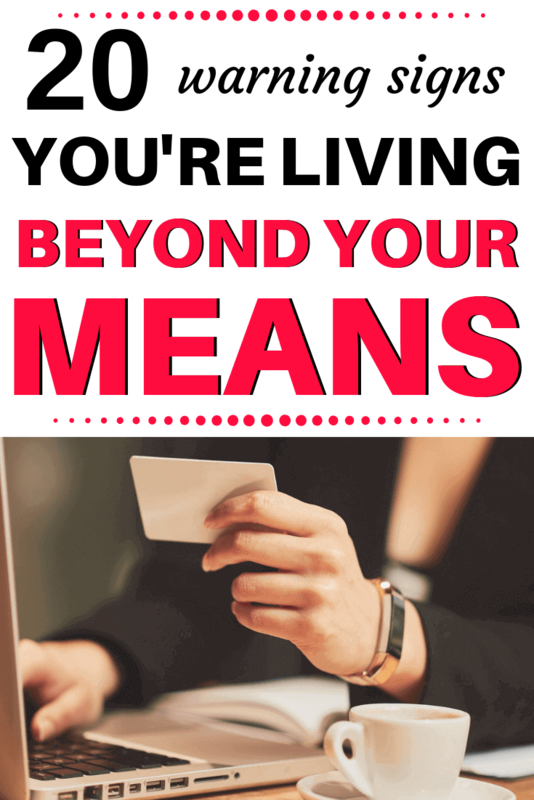 Living within your means isn’t restrictive when you budget your money. If there’s something you really want, then just make sure to budget for it. There’s no material object worth trading your peace of mind and financial happiness for. This makes it clear to you (and everyone else) that you’re living beyond your means. And that’s not the kind of impression you want to make. Again, this is what an emergency fund is for. If you’re having to eat rice and beans every night just to afford the new iPhone, then I probably don’t have to tell you that you’re in over your head. But, you’d be surprised at how many people skimp on basic essentials like food, shelter, and transportation just so they can make low value purchases. Those are the people who go into debt to get a car when they can’t even afford to fill it up with gas. Prioritize your spending with a budget. Someone once told me that social media was the devil to their wallet. Do you ever find yourself buying something because you saw it on social media and just had to have it? Or worse, buying things because you felt pressured? Don’t go broke for someone else’s approval. If there’s one thing I learned about the Joneses – it’s that they’re broke too. Be a role model for your own financial life. You’re welcome Elaine. I always say, “If I knew then what I know now…” but better late than never 🙂 Thanks girl! I think you can never have enough emergency money. I always read to have a 1000.00 fund. I try to save as much as I can towards it but in the past year I have had a chimney fire. I had to get fixed or no heat for the winter and that was 3000.00 and then there was always something going wrong with my pickup and that was about another 3000.00. So beware of just a 1000.00 fund. I very much agree. The more, the better. I remember when the 2008 recession hit, several financial experts were recommending an emergency fund to cover 10-12 months of expenses. That’s always been a personal goal of mine. Thanks for reading Sandy! Hi we have to set a budget and start saving money. And am trying to get a job so can get started to pay the bills as there is only one wage coming in. And to start to get out of debt.